Quartz is the second rich mineral in Earth's continental crust. The crystal structure of the mineral is a constant framework of siliconâoxygen tetrahedral along with each oxygen shared between the two tetrahedral. 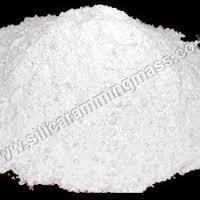 Quartz Ramming Mass is the mixture of silicon dioxide, or silica as an element of rocks in the structure of pure deposits. This is a necessary ingredient of igneous rocks like rhyolite, granite, and pegmatite. The available range is highly pure and adulteration free in nature ensuring to provide the best performance. This is available in white color with high level of purity without any adulteration. As per the different demands, the range is available in varied packaging options at very affordable prices. With tampered proof packaging options, it comes with complete safety to provide no harm during transit.